Most of the people who leave their jobs and start a business of their own do this on an impulse. The reason is simple. Working in an organisation means you are answerable to the people higher up the success ladder. Often due to office politics, even the right decisions by you aren’t appreciated. Some people despise being under someone. These are reasons that probe them into starting their own private venture. While there are many who start something new, few succeed. 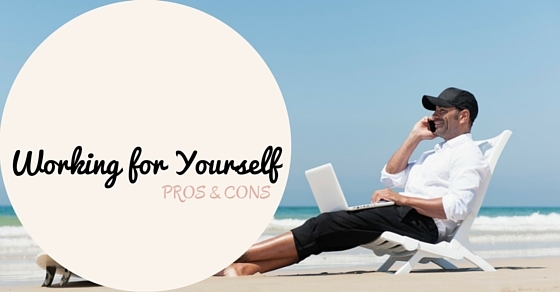 Here we have listed out the pros and cons of working for yourself. This is because few truly understand the pros and cons of working without a boss. This list is sure to help you decide whether to work by yourself or not. It is always fun to think that you are working for yourself. You do not have any fixed schedules to adhere to. You do not have anyone to dominate you or fire you. The independence that a personal venture brings along with it is always thrilling. Yes, there sure are countless benefits of working for yourself. Here we have listed out a few prominent benefits that usually lure people to starting their own venture. The most annoying aspect of a job is a boss who is there to dominate you. If you have a good and understanding boss, you are lucky. But most often bosses tend to be bullies who exploit their juniors and extract maximum work from them. People who are under such bosses would surely prefer to have their own venture. When you start your own business or startup, you can work on your own will. You do not have to abide by anyone’s orders. This is particularly good for people who do not possess the knack of diplomacy. People who do not know how to handle different types of people or convince others in a gentle fashion should opt for a personal business or venture. Many people complain that their office schedule is so hectic that they do not get ample time with their loved ones. This is one problem you won’t face if you have your personal venture. You can schedule your work such that you get ample time with your near and dear ones. There is no restriction regarding the time you should reach office or the time your should leave office premises. This lack of restriction in a personal venture allows you sufficient flexibility to balance personal and professional lives. It also helps to reduce the level of stress that is very common in job life. Most creative and thoughtful people despise their jobs because the job gives them very little opportunity to explore and experiment. An age-old organisation with a set reputation will never bear the risk of experimentation from an employee. Most employees thus experience stagnancy after 2 or 3 years in a certain organisation. This is not the case when you start your own venture. You need to be alert all the time. You need to come up with new strategies and ideas that help to increase growth of the organisation. These aspects of a business make it much more interesting than a job. There are many individuals who are not good at tackling office politics. They do not enjoy going with the flow if they think the decision is wrong. This attitude can jeopardise their job in the long run. A person who starts his own venture does not have to go through the ordeal of convincing the people ongoing ahead with wrong decisions out of peer pressure. You have the freedom to take the right decisions. You also have the freedom to make choices. This way you can completely avoid the politics part of the work management and ensure work gets done without wastage of time. The best part is that you are the boss when you start your own venture. You get to meet people at higher positions. You get special benefits as a businessman. You get respect in your family and social circles. No one has the right to rule over you. You have the complete control over your situation. Everything that has a good side has a bad side too. While there are many benefits of working for yourself, you cannot completely ignore the ills of the same. The risk is elevated in case of a personal business. You need to possess the courage to take such risks. You also need to possess the foresight to predict the growth of the business. There are some major drawbacks of working for yourself. Here we have listed these out for your knowledge and reference. A high level of maturity is essential to ensure that you prosper and grow in your business. This means that you need to have a fixed set of personal etiquettes and a proper code of discipline. These are necessary to ensure that your business grows and expands. People who lack a strict discipline may misuse the funds from the business for their personal needs. This can eventually lead to the failure of the firm and organisation. Individuals who have strong principles are capable of controlling their urges. They make sure that they set aside a certain amount as business funds and use the rest to grow their business. They tend to use just about 20% for their own personal needs. In the initial stage of the business, any loss could mean that you need to put money from your pocket. You need to have some backup money to handle such situations. Usually traditional families are not very supportive in case of businesses. You may not have family support and if you are not confident about your venture, their words could demotivate you. People who are capable of foreseeing such possibilities and tackling them smartly can start ventures and succeed. Patience is an important quality that every businessman should possess. Business ventures do not grow in a day. They require time, effort and dedication. They require you to consistently put in efforts. Instant gratification happens only in fairytales and if you expect the same in your life, you are being foolish. You must try to grow gradually and save a small amount as profits. This way, the profits you save can later be used for further expansion without disrupting your income. When you are working for a firm or organisation, you have job security if the firm is doing well. When the firm is in a loss, you simply need to switch the job and if you are good in your field, you will continue to make money. This is not the case with a business or startup. Inspite of all the research, it is not always possible to predict whether a firm will make a profit or loss. Everyone may not be capable to handle this kind of job insecurity. This simply means that you need to plan your finances properly. You need to have a well defined growth plan when you have your own venture. You should have a clear idea how much money you wish to make at the turn of the year and how you plan to grow. A proper plan will help you allocate funds and grow your network accordingly. If you don’t have a proper growth plan, there are greater chances of misuse of money and finances. You should not get carried away by temptations. You must keep in mind that you can grow only when you stick to your principles. Many people tend to overwork when it is their own business. This affects their health adversely. You must keep in mind that to make more money in future, you need to remain healthy. Hence you need to take special care to maintain your health. This is very important for people who do office jobs and have to sit in the same place for a long time. Since it is your own venture, you may overwork out of enthusiasm and this may eventually affect your health and welfare. While a personal venture is important and you need to give more time to it in the initial years, you must never compromise on your family time. Family is definitely more important than making some extra bucks.